User Defined Gmail Accounts Data Backup i.e. Single & Multiple. With the help of gmail backup software you can easily take the back up gmail accounts data such as emails, calendars, contacts etc. You can also use gmail backup tool to archive gmail data of single or multiple users as well respectively. For the same you must have the gmail account credentials. 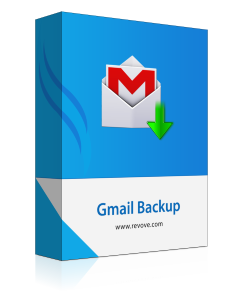 The Gmail Backup software provides the advanced mechanism for selectively backup of gmail data such as emails, calendars, contact & documents. You have to only check or uncheck box provided near each items. The software archive only selected data as per user requirement. The Gmail backup software provides the advanced filters such as date filters. If you want to create back up gmail data of particular date then you can use date filter. For space requirement, you can also delete your gmail data from the server after creating the archive of gmail data on local hard disk. By doing so, you can prevent data theft from the server. Thus adding up security to your gmail data. Moreover, You can use same data from the recently created backup. Does software safe to use? Yes, the software is safe and secure to use. The software is tested millions of time after the deployment in different key sets. Is there any limitation to use the software to select the folder? No, there is no limitation to use the software to select folders. Can, I recover deleted Gmail emails also using the software? No, You can recover deleted emails. The software only design to take backup.. Does the software allows to backup of customized domains? No, The software is set to backup of only @gmail.com domains only. How can I use software to import gmail to apple mail? The software provides the enhanced features to migrate gmail to apple mail. With the help of Gmail to Outlook Backup Software, you can also migrate easily from gmail to outlook. 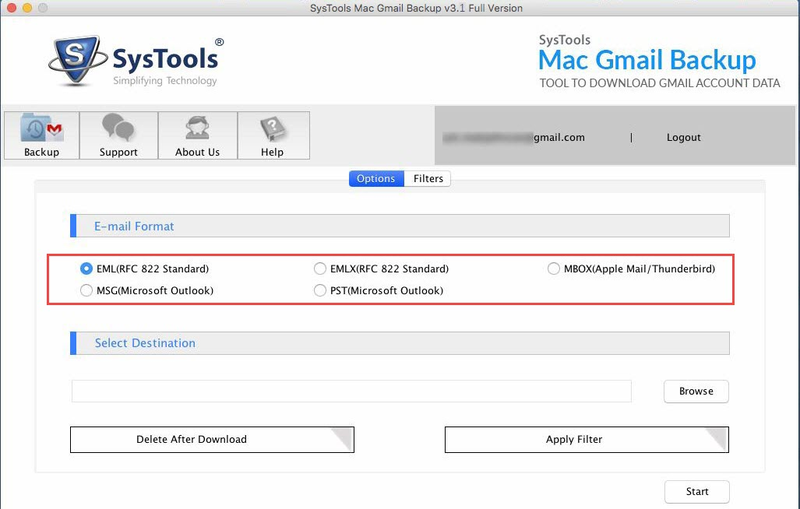 When you are using gmail backup software then you do not need to install Outlook to transfer gmail to outlook emails. Apart from this software also allows migrating contacts from gmail to outlook. For this you will have to select PST file format in destination. Then import resultant pst file in Outlook using Import/Export Wizard. The Gmail to Windows Live Mail Archive Software is so procured and professional that it can be used for the transfer of gmail to windows live mail without loss of any data. You do need any external software for importing contacts from gmail to windows live. You have to only select EML file format in destination. After that you can easily access gmail data in windows live mail. Gmail to Apple mail archive software helps user to transfer gmail to apple mail with items such as emails, calendars, contacts, documents. Select mbox file in the destination then gmail to apple mail backup software creates archive of gmail data in mbox file format. Then after, you can easily import gmail data in apple mail to view content of gmail on apple mail email platform. Gmail to Eudora backup utility is one of the outstanding tool to import Gmail to Eudora with complete data items such as emails, contacts, calendars, documents. You have to only select mbox file format in the destination. The Gmail to Eudora backup software creates archive of gmail data in mbox file. Then after import gmail archive to thunderbird. 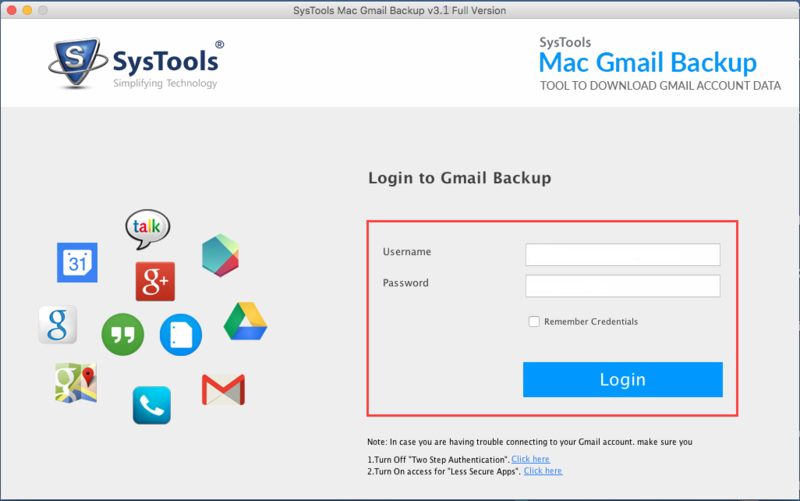 With the help of Mac Gmail Backup Software, you can easily backup the entire data of mac gmail account. It includes the Emails, Calendars, Contacts etc. 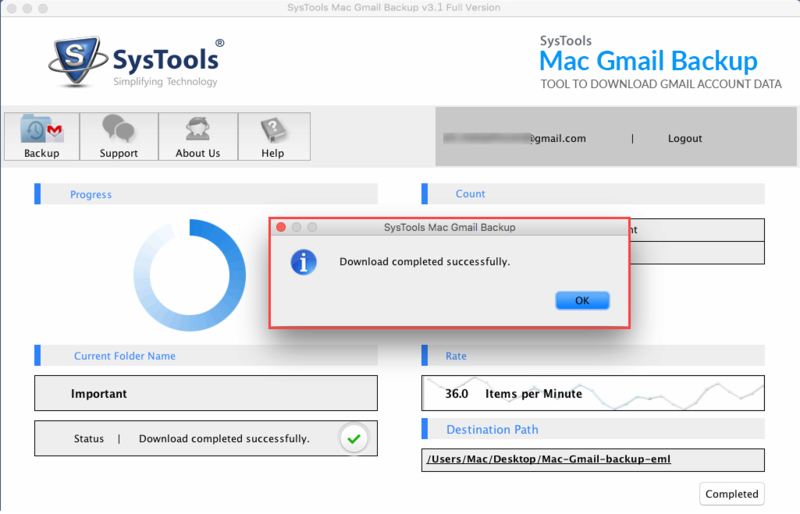 The Mac Gmail backup tool provides the enhanced functionality to pause and resume backup process. In the case of any internal or external distractions or the interruption, the software automatically pauses the backup process and wait for your commands to wake up. The Google mail backup software fro Mac provides the extended filter option to selectively backup of folders. For thus, user have to use the check and uncheck box against the folders such as inbox, drafts, sent, email, spam, starred etc. The mac gmail backup software is completely enhanced with the customized features to increase the simplicity and ease of gmail backup process. The user can use the filter via folder or with the date range. The software automatically generated the gmail account history for the interrupted backup process. It lists the reason for interruption and helps user to understand the actual reason for the failure of gmail backup process. 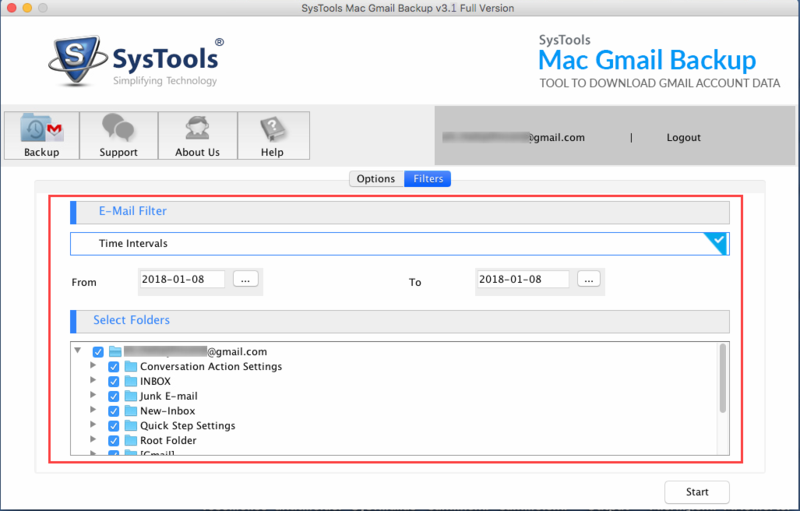 The Mac Gmail Backup tool allows saving the data of gmail account in the EML, PST, MSG, MBOX and EMLX file format on the hard drive of the user. After then, the user is able to access the content of gmail on any email platform. EML: Supported by Windows Live Mail, Outlook Express etc. MBOX:Supported by Opera Mail, Thunderbird tec. Can I backup multiple gmail account simultaneously use the software? Yes, with the help of software you can easily take the backup of multiple gmail account simultaneously. Does there is any possibility of data leakage while using the software? No, There is no possibility of data leakage during the backup process. The software works on the SSL protocol to provide the safe and secure environment. Is there any facility to selectively backup gmail data? Yes, the software provides the facility to selectively take the backup of gmail account data. I was in search of software that can backup my gmail data to prevent it from loss or being hacked. Then luckily I have found Gmail Backup Software which helps me the lot to attain my goal. I was glimpsed after using the utility. Apart from this, Software interface impressed me the lot. I would like to recommend this software my friend circle as well to transfer gmail to windows live mail. Great Works by the dev team. t is one of the best gmail backup software that I have used to back up of my gmail data. The functionality to take the back up of gmail in multiple file formats is out of box thought. I easily import my gmail data to outlook without any hurdles. Now I am able to view the content of gmail data into outlook on my desktop. Thanks for such nicely built innovative software. Mac Gmail backup software is one of the best tools for taking backup of gmail account in simpler and convenient manner. The software is so easy to use. I simply download the software on mac machine and then in quick time I take the back up of gmail account on mac operating system.